Muhammad Ali was the self-professed 'greatest' and he lived up to the tag while still known to the world as Cassius Clay, a brash and friendly 18-year-old who competed in the light heavyweight division at the 1960 Olympics in Rome. Clay advanced to the final with ease. 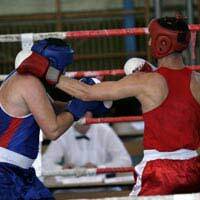 The referee stopped his opening bout against Belgian Yan Because in the second round, and Clay scored unanimous points decisions over Soviet Gennadi Shatkov - the middleweight gold medallist in Melbourne four years earlier - and Australian Anthony Madigan. In the first round of the final, against three-time European champion Zbigniew Pietrzykowski, Clay looked in trouble. Disconcerted by his southpaw opponent, Clay took a flurry of punches and showed his inexperience by closing his eyes against a combination. But in the second round, Clay used agile footwork to steer clear of Pietrzykowski, a light middleweight bronze medallist at the 1956 Games, and was able to lower his guard. Clay went on the offensive and threw four hard right hands to the Pole's face, but he later admitted: "Even after round two, I knew I needed to win the final round." He did, moving in and out and unleashing a series of combinations. Abandoning his straight left, Clay drove a right through Pietrzykowski's guard and the Pole was defenceless on the ropes, his face covered in blood, when the bell came to his rescue. With his Olympic gold medal secured, Clay turned professional and went on to become one of the most famous people in the world. In 1964, he stopped Sonny Liston to become heavyweight world champion, a title he defended nine times over the next four years. Clay converted to Islam, changing his name to Muhammad Ali, but, when he refused to be drafted into the United States army during the Vietnam War, he was stripped of his title and did not fight for three-and-a-half years. Ali knocked out George Foreman to regain his title in 1974 and defended it 10 more times before losing to Leon Spinks, whom he then defeated seven months later. He retired from boxing in 1981 with a professional record of 56 wins and 5 losses, and in 1996 was chosen to light the Olympic flame during the opening ceremony of the Atlanta Games. Teófilo Stevenson was the first boxer to win the same weight division at three Olympics. The Cuban, competing in what is now known as the super-heavyweight division, made his Games debut at Munich in 1972. In the quarter-finals, Stevenson faced a rematch with Duane Bobick, who had beaten him at the previous year's Pan American Games, and stopped the American in the third round. His semi-final victim, Germany's Peter Hussing, admitted "I have never been hit so hard in all my 212 bouts", and Stevenson's opponent in the final - Romanian Ion Alexe - forfeited because of a broken thumb. Four years later in Montreal, Stevenson disposed of his first three opponents in a record seven minutes and 22 seconds. Romanian Mircea Simion made it to the third round in the final before his handlers threw in the towel. Hungarian István Levai ran around the ring for three rounds to become the first Olympic boxer to go the distance against Stevenson in the semi-finals of the 1980 Games in Moscow. Stevenson then defeated Soviet Pyotr Zayev to earn his third gold medal.